Itzhak Perlman performed Vivaldi's "Four Seasons" and conducted the Los Angeles Philharmonic in Berlioz "Symphony Fantastique"
Violinist.com: "(Perlman's) humor as a performer, his ease of manner, and the vibrancy in his sound all make his presence so immediate…"
Los Angeles Times: "In the two 'Seasons,' Perlman the violinist had a somewhat rocky beginning but soon regained his form – mostly straight-forward, subdued playing with the occasional burst of opulent tone and emotional generosity." Los Angeles Times: "She displayed ravishing tone and sure technique in a clearly plotted performance that respectfully let Bernstein be." Calgary Herald: "...nowhere did soloist and orchestra better capture the lyrical Italian spirit of this festival than in the rondo à la clochette finale, all pulled off with a virtuoso élan to a well-deserved standing ovation." New York Times: "It would be hard to imagine a more compelling and accomplished performance, both from Ms. Josefowicz and the inspired Philharmonic." ConcertNet: "(Josefowicz) has instincts for modern composers, she has the fingers to play anything. And in this work, which I heard for the first time, she has the breadth for a half-hour of almost non-stop playing." 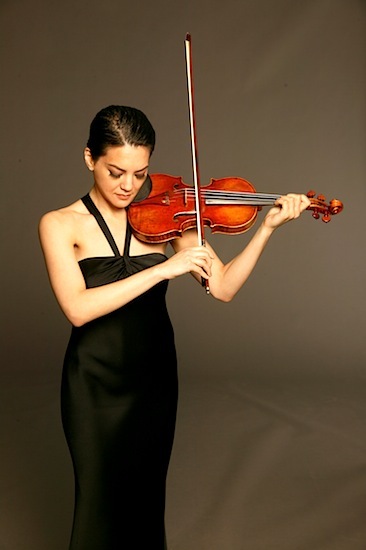 NUVO: "Gluzman's violin, a 1690 Strad, frankly outshone his playing of it. Its uniquely mellow timbre and its blend with the orchestra's strings was as near perfect as I've heard." The Age: "Following his account of Vivaldi's A minor Violin Concerto RV 356, distinguished for its elegance and precision, concertmaster Wilma Smith partnered Ehnes in the same composer's Concerto for Two Violins RV 522." Lincoln Journal-Star: "Quint has a sense of lyric opera in him, evident in his grandiose body movements in synch with the music. When not playing, Quint turned his attention to LSO conductor Ed Polochick and the orchestra, listening, interpreting their interpretation and taking it from there. The result was a rendering of the Tchaikovsky work seldom surpassed on recordings or anywhere. " Did you attend a concert or buy a new recording this week? Please tell us about it, in the comments. The review of the Gluzman performance was as idiotic as I have ever seen. When did a violin ever make a tone without a violinist? Feel free to criticize the critics. Yes, that review of Gluzman reminds me of the old yarn about Heifetz, when an audience member came up to him after a concert and bubbled on about what a great sound his instrument had, then Heifetz held the fiddle up to his ear and said, "Funny, I don't hear anything!"